Wolverine Marvel Video Slot Guide & Review - Casino Answers! 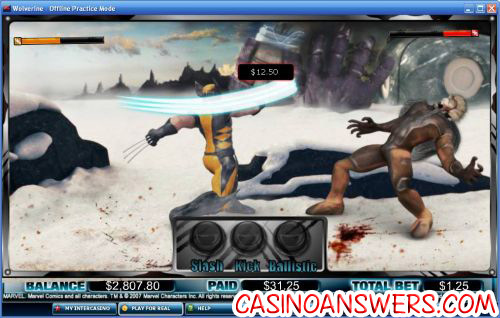 The Wolverine video slot is a 5-reel, 25-line Marvel Jackpot slot machine. It has a bonus game and progressive jackpots. It’s playable at Cryptologic casinos such as VIP Casino.Play at this years #1 online casino for United States - Slots.LV. If you’re a fan of the X-Men, you’re probably a fan of the team’s most popular character, Wolverine. This video slot is based on the comics, rather than the 2009 feature film X-Men Origins: Wolverine. Any big Wolverine fan knows that Wolverine made his first appearance in Incredible Hulk #181 and joined the X-Men in Giant X-Men #1. He has been one of the most popular characters in the Marvel Universe ever since. The Wolverine slot features three Progressive Jackpots. There’s a Hero Jackpot ($100s), the Super Hero Jackpot ($1000s) and the Marvel Hero Jackpot ($10,000s). Each of these Marvel Jackpots is awarded randomly. You don’t even need to match any symbols to qualify. However, the size of the wager you make on a spin will determine the chance of winning a jackpot. That means the more you bet, the higher your chances of winning big are! Wolverine also has a re-spin feature. This is triggered when three or more Wolverine substitute (or wild) symbols appear on a single spin. The reels that the Wolverine symbols appear on are held, while the remaining ones are re-spun. 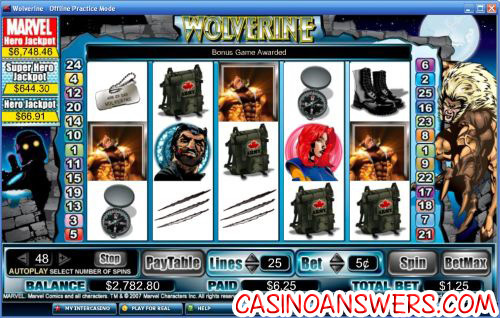 You can find the Wolverine slot at VIP Casino. If you haven’t yet signed up at VIP Casino, there you can get a signup bonus of 100% up to $225. For returning players, VIP Casino also offers monthly reload bonuses of 100% up to $150 every single month! Does the Wolverine slot machine have any progressive jackpots? You got it, bub. The Wolverine video slot is linked with the same three progressive jackpots as every other Marvel Jackpot Slot at VIP Casino – Hero, Super Hero and Marvel Hero. I’m an online casino played based in the United States. Can I play the Wolverine slot machine game? Unfortunately, American players are not able to play the Wolverine video slot for real money due to the UIGEA. Instead, we suggest that you head over to Vegas Days Casino and play some of their iSlots which are just as fun!